Thanks for a really fascinating post – would it be possible to see the survey questions you asked participants? I’m curious what kinds of questions you used in the lead up to presenting the ballot. 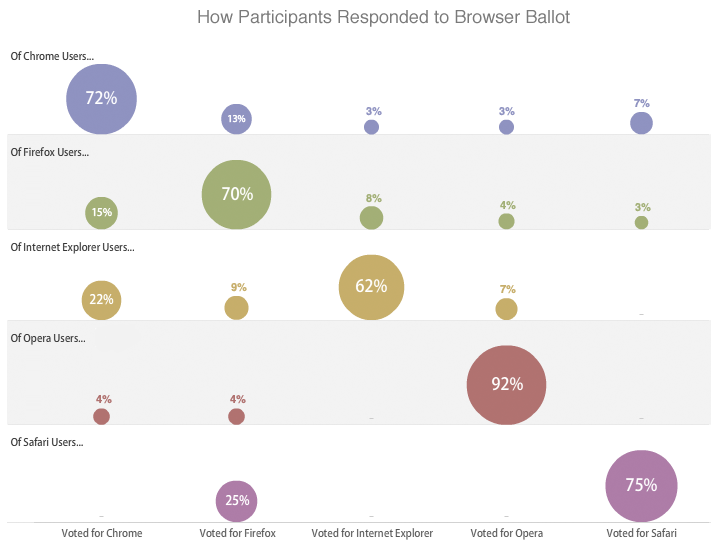 This is all exactly what I’d expect, really, and the analysis seems pretty much spot-on, with the exception of the reasoning behind why there were so many Chrome choices by IE users. I’d suspect that the answer lies more along the lines of people not having any idea what a browser is, not reading text, and thinking that Google is itself in fact “the Internet”, and that thus when you ask them something about how they want to use the Internet, they pick Google. 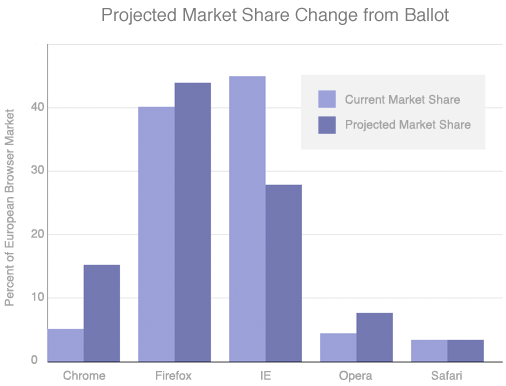 The ballot could, in pretty short order (Microsoft has committed to completing the roll-out to the installed base over a period not greater than 5 months) put Firefox in first place for browser usage in Europe. The installed base (all current Windows users in the EEC with IE set as their default) will see this ballot rolled out over 5 months and your investigation makes some (I think) compelling estimates of how that will fall out. But I have another question that might be equally important to investigate. Microsoft has also agreed to present the ballot as part of the normal first or near first run experience for every new Windows machine that ships in the EEC for the next 5 years. This case covers two groups of people, I think. First, it covers the “upgrade” or “second machine” people who are already online and who are buying a new PC. Second, it covers the actual growth of the Web case where people are getting their first computer and going online on their own computer for the first time. But the first group, people getting a second or a new PC, might actually behave differently from the installed base when they confront the ballot. Do you think there could be enough difference to warrant a follow-up Mechanical Turk or other study to see if there’s anything we should be doing later in the year after the installed base is all finished with the ballot and we’re just dealing with new PCs? The reports I’ve read from Gartner and iSuppli suggest that ~100 million new PCs are purchased each year in Europe and my estimate is that 1/3rd of those are first-time purchases. That suggests that somewhere around 150-200 million new PC users will see this ballot over the next 5 years. It might be nice to think about how that might unfold for users. Means 30% wanted to change teams from FF and 28% from Chrome. And IE was 38%. It does nudge my perception a little. And good news in the security area, seen in the light of some negative press last year. Some website made assertion that “FF was the most exploited browser, etc.” And Forbes included FF on its software in danger of exploitation list. Google is FF’s main sponsor, whose pledge of not to be evil is less heard nowadays. Hmmm. The hope lies with the Community. The Geek shall inherit the Internet. Opera, the Sushmita Sen of the Internet. Why doesn’t she get the spotlight she deserves? She should’ve cornered 20% at least. Not that I succeeded in sticking with opera. I never seem to get infected with the x-factor that ties down the 92%. BTW, I typed this on The Fox. Maybe the turks desire of “being curious to see what else Google could do” were somewhat influenced? Like Mrs. Google whispering nice words on their ears through giant billboards in the subway? I think it’s possible the marketing campaign is having some effect. Google builds its brand recognition both through its search engine and advertising. However, Chrome’s market share has not yet gone up significantly since the beginning of the ad campaign. Further study would be needed to see what, if any, effect it is having. Thanks for sharing good information…!! Good day very cool site!! Guy .. Excellent .. Wonderful .. I will bookmark your website and take the feeds also?I’m satisfied to seek out numerous helpful info right here within the put up, we need work out extra techniques in this regard, thanks for sharing. . . . . . The services offered by SEO company India possess a quick turnaround time of 4 to 5 days. cost. These links will help you advertise your products and services in addition to increase your brand awareness. także do pieczary. Tudzież dodatkowo wielmoże www. davidbisbal.be narzekają, bajdurzą, iż suzeren. Z zakłopotaniem pociągnął z garnca. – Istotnie, później. .. – zimno przynagli go ry.